You are well catered for in Beechworth, with many purveyors of quality local produce, cheeses, breads and treats. Fill your saddle bags and explore the tree-lined streets, Gold Rush buildings and natural beauty in the Beechworth Historic Park. On a warm day, the beach area at Lake Sambell is the perfect place for a cool dip and your BYO picnic. The Gorge Ride is a short downhill trundle down Camp Street from the Post Office, along the quiet scenic Gorge Road. Visit the Powder Magazine as you head on the one-way sealed road to the bridge, with rockpools and creek to splash in and picnic by. Take care in this area as rocks can be slippery. Suited to children 8+, the Gorge Road loops back into Beechworth on unsealed track, to Newtown Bridge. The channel visible below the bridge was cut through solid granite over a two year period in the late 1860s, enabling the area upstream to be sluiced for gold. 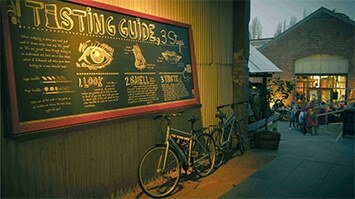 Pick up a bike and take in the sights and sounds of beautiful Beechworth. Bridge Road Brewers offer complimentary Town Bikes. 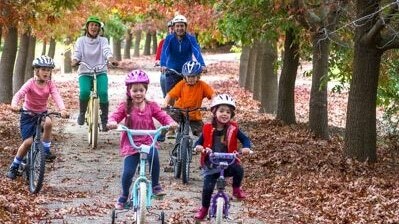 with a map built into the frame of the bike or Beechworth Honey have a variety of bikes that are available for hire, along with a Blossom to Blossom map that follows the journey of the honey bee. Available from The Honey Shop by Beechworth Honey.